How does Summer Bible Study strike you? Have you ever read your Bible on the beach? In the pool? During Shark Week? I have had a number of questions about Journaling Your Journey [with Jesus] and I am grateful you have reached out with your questions, comments, and the desire for MORE. Some of you have picked up with journaling again, or for the first time. Some are taking a deep breath and seeking Scripture with renewed hope. Many of you are overcoming obstacles, stumbling blocks…or pain and daring to take a step of faith; daring to consider trusting the unseen possibilities. Even the possibility of trusting (anew) and reaching out for the unseen One who makes all things possible. I thank God for these wonders. Modern day miracles. God is still changing lives, softening hardened hearts. God is still healing the broken-hearted, binding up the wounds and drawing each of us closer to His love and faithfulness through His loving-kindness, mercy and divine power. He is able to do it all. And so much more. I have been pondering and praying how to answer the questions from some of you, on the specifics of my own journaling and quiet time seeking this God who longs to be known by His own. It has left me a bit at a loss, as I truly do not want to hand you some snake oil formula or slick script, “How to Get REAL Close with God in 7 easy steps”. It all feels so …impossible and wrong. But, the fact remains, intimacy with God is possible and desirable. As I tried to figure how to urge you to dig into scripture, seek the Lord in prayer and journal your journey, I realized the audacity of my endeavor. I mean, I cannot replicate the intimacy I share with God daily, and of course I shouldn’t…anymore than a husband and wife should share the intimacy of their own marriage bed. ( I know, I went there) How could I invite anyone into the chaos of this time or replicate the how of my time spent learning, listening and leaning in to the Lover of my Soul? Yet, I do wish that everyone did have this wonderful opportunity and would not be intimidated or overwhelmed by the possibility of it, but instead excited at the adventure awaiting those who are not afraid to follow Jesus. Or even if afraid, follow anyway. So here we are post Journaling Our Journey with Jesus…and where do we go next? I am one who does not like anything that seems preconceived or to formulaic as I already mentioned. Yet, I really want to see you stay with your journaling journey. Or if you bailed, to try again. I have some good news. Today I had an epiphany as I considered the impossibility of replicating my quiet time to lead you deeper into the heart of God. For some reason, I recalled the Acronym S.O.A.P. I know, you are thinking…perhaps the Holy Spirit wanted me to come clean. No- well…yes, but beyond that, I decided to check it out and one Google Search led to another and the next thing you know, I am thanking God for His amazing ways. I want to invite you into the next phase of Journaling Your Journey with Jesus… for those who were wanting a bit more structure. As I perused the simple Bible Study options, the simplest for quiet time might be found in that little acronym. What I discovered was I basically use the various parts of the S.O.A.P. method in my journaling/quiet time, just not in the specific order. And with some creative (spirit-led) flexibility. What I realized was, that this is an excellent way to add some focus and structure with handling Scripture and the journaling part is built right in there! S.O.A.P. stands simply for the specific steps involved in basic Bible study: Scripture reading, Observation, Application, and Prayer. The writing of Scripture and journaling each aspect out is built into this type of study method. Now as I said before, when I approach scripture I am seeking direction, and practical application. I ask questions with my pen and await answers. I record observations, insights and reflections. But, this might help you more comfortably and confidentially combine your scripture reading and journal writing. It will deepen your prayer life and and help you in. I also stumbled upon a reading plan I had not previously seen. As a Sunday School Teacher this plan appeals wildly to me. Or is tht just the planner person in me. Either way, I am intrigued with it. It is a 1 year reading schedule which allows one to read through the Bible in the following way: Epistles on Sunday, the Law on Monday, History on Tuesday, Psalms on Wednesday, Poetry on Thursday, Prophesy on Friday, and the Gospels on Saturday. What? Why had I not thought of this? It’s as if it were meant just for me. I will be jumping in onto this schedule as I continue to Journal my own journey and will make updates to how it is going periodically on the blog. You can go and have a look at the variety of plans, and find one that suits you. Or join me in the one above. This is the main S.O.A.P. page, where you can have a look at the details. I am not sure beyond the description how to use the website. I had some trouble when I attempted to join in. Which is fine because my journaling journey is a paper and pen one primarily, not a typing on the computer one. Just plan on checking out the simple instructions there. In Grace Always shares cute printables for the S.O.A.P. method and also her own experience using this Bible Study method. Revive Our Hearts shares the a-e-i-o-u Bible Study Method – just check it out for ways of approaching Scripture with questions. This is a favorite ministry of mine! I am going to introduce the S.O.A.P. method into my journal keeping and quiet time and see how it goes. Would you like to have a go at it as well? Let me know if you have tried it or are going to. I am thinking it might help me start my time in an orderly way before my rambling journal entries. We will see. It is so close to what I do, minus the formality of letters. I am hopeful it will add to an already rich endeavor. Perhaps it will help you if you have struggled with the journaling aspect, or if you have been lost in your Bible reading. I pray however God leads you, you continue to Journal Your Journey with Him! Additionally as a Summer book I will be reading through and doing the exercises in this book: Your Beautiful Purpose by Susie Larson. I won it awhile ago, and decided to pick it up and take it with me on our family trip. My reading, aside of the Bible this year, has been amiss. I am hoping vacation will jumpstart my reading time once more. Summer means some more flexibility but I like to take advantage of it by adding something requiring I don’t slack. See you soon as we Journal our Journey with Jesus …all Summer! ! Thank you thank you thank you! I’m going to try it again! SOAP sounds interesting… Going to find some printable so and give it a go! I appreciate you Dawn! Thanks for sharing, Dawn. Just want to say i enjoyed quiet time with Jesus at a summer cottage (at a writers’ conference) this past weekend…sometimes just changing your place for devotions gives a fresh perspective! I didn’t know it had a name but this is basically what I do every day. Summer is a special time for me since I am basically on vacation the whole time. I start nearly every day with about 2 hours spent in the Word, prayer and journaling. I so miss it when school starts back up. 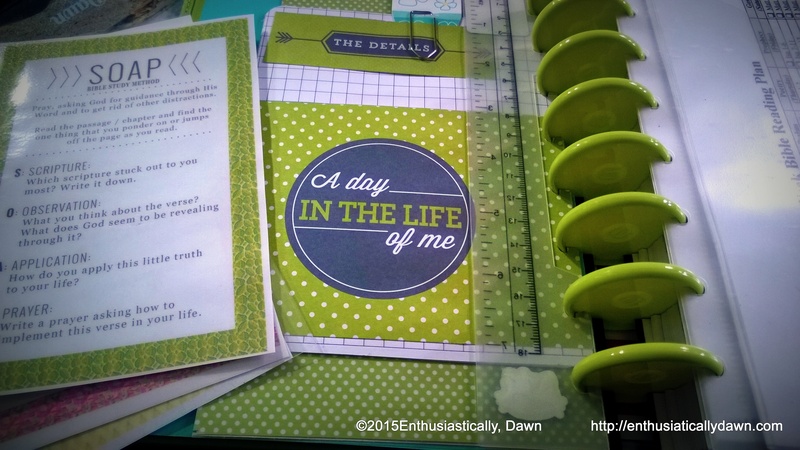 Dawn- I love new resources and the various sections of the Bible on certain days! Great idea! You’re challenge has spurned me on to spending more time in Scriptures as I journal…I’m looking forward to some good ole summer SOAP times! Thanks!